Our next meeting will be at 7.30 p.m. on Monday 8 November at the King’s Church building, Brooks Road. Colin Brent, doyen of living Lewes historians and author of several books about the town, will be speaking on the topic ‘Gems of Lewes Architecture & Design, 900-1900’. As usual, all welcome. Edmund Critchley, who regularly attends our meetings and is himself a doctor, has recently published ‘Dinosaur Doctor, The Life and Work of Gideon Mantell’. Gideon Mantell (1790-1852) is best known for his discovery of the Iguanodon and his work as a geologist and paleontologist, but he was also a prominent local doctor, practicing from his High Street house below the Castle. He was the son of a town cordwainer, or shoemaker. 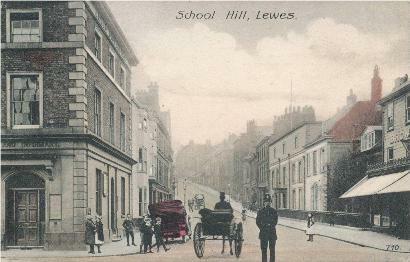 He later moved from Lewes to Brighton and on to London. Edmund’s book is published by Amberley Publishing at £18.99, and is available in local bookshops, such as that at Barbican House. This entry was posted in Art & Architectural History, Biographical Literature, History of Medicine, Lewes, Social History, Transport History and tagged Dinosaur Doctor, Edmund Critchley, Gideon Mantell, Lewes Infirmary, Stage coaches, Sussex Express, Workhouses. Bookmark the permalink.